The SmartSeal Temperature Sensor system is designed to detect and warn of various vessel conditions that may lead to shaft seal damage or failure. The system is available for use in single or twin engine vessels and consists of a Main control unit and a set of peripheral units. The system employs electronic sensors (thermistors) to measure temperature. The sensors are monitored by a microprocessor that processes sensor data and reports the summarized warning and status information to receiving peripherals. 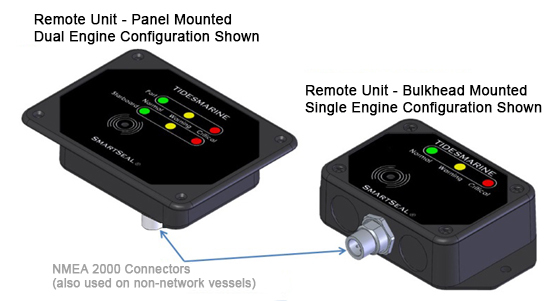 These peripherals range from simple warning and status indicators on the Main and Remote units to transmission of NMEA 2000 compliant messages to main or auxiliary vessel computer systems. The system is comprised of a bulkhead mounted Main control unit and one or more Remote units. Remote units are available in panel or bulkhead mounting configurations. The system may be installed on vessels equipped with a NMEA2000® network but will also operate on non-NMEA 2000 vessels. The Main unit is installed in the vessel’s engine room or compartment. 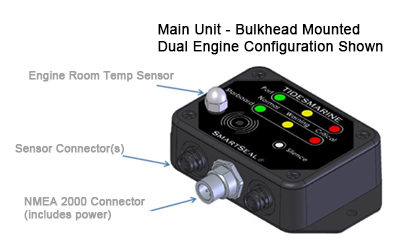 An engine room temperature sensor is included with the Main control unit. The Main and Remote units are IP66 rated (waterproof for heavy spray and brief submersion), so any unit may be mounted in damp or wet locations. The panel mounted Remote units are additionally O-ring sealed against the face of the panel they are mounted to so may be used in locations which are exposed to rain or sea water (e.g. mounting on a flybridge). You may order the Smart Seal Temperature Sensor online. When a Smart Seal System is fitted in conjunction with new Tides Marine SureSeals and the installation is registered with a Tides Marine office, an additional 3 year warranty (total 5 years) will be offered against damage caused to the SureSeal by an overheating event.